How is the organization of Porto’s Tournament proceeding? What will be the news? The Porto Beach Rugby will take place on June 22nd and 23rd and, for the first time, will be part of the European circuit of Beach Rugby. Porto is an amazing city, winner of several touristic awards including the Best European Destination in 2017, and it awaits the visit of the best European Beach Rugby Teams. Porto local holiday, São João, will take place on the night of June 23. The city won’t sleep, and you are invited to join this fantastic party. Let’s talk about EBRA SERIES: there have been so many changes, especially in the regulation, how do you live this moment? Do you think that these innovations were useful for the growth of the series? Due to EBRA changes, I have no doubt in saying that the circuit will increase considerably in terms of quality and number of participants. Participating in the EBRA Series will be a fantastic time for all teams. Beach rugby is a fantastic sport. In your opinion, what must change to become a “professional” movement? To become more professional, I believe it need to expand tournaments to new countries, increasing the organizational quality of tournaments, awarding good prizes, invest in better promotion and invite international players . These are all factors that can bring even greater quality. Looking at the future of EBRA, what would you like to happen? Where should you go to work according to you to establish yourself definitively? The work developed by EBRA is giving good results, so in a few years Beach Rugby will significantly increase its importance. I would like to be able to watch big tournaments in the big european cities and even in other parts of the globe. 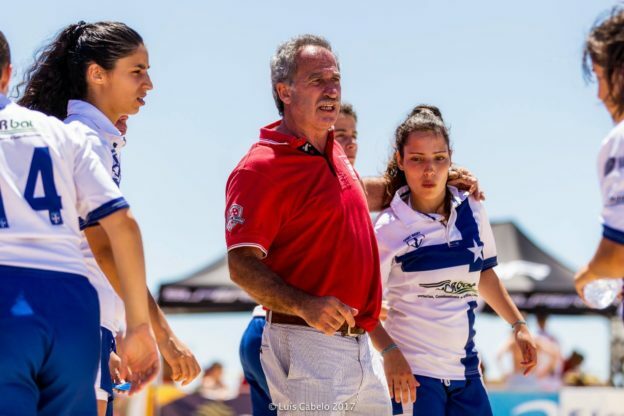 This entry was posted in News and tagged beach rugby, Nuno Gramaxo, Porto on February 15, 2019 by EBRA Admin.